Not to be confused with China Post or The China Post. The Chunghwa Post Co., Ltd. (Chinese: 中華郵政股份有限公司; pinyin: Zhōnghuá Yóuzhèng Gǔfèn Yǒuxiàn Gōngsī; literally: "Chinese Post Stock-share Limited Company"), is the official postal service of the Republic of China (ROC), providing mail service for Free Area of the Republic of China, which covers Taiwan, Kinmen, Matsu, Pratas and Itu Aba. It also provides a savings account service. 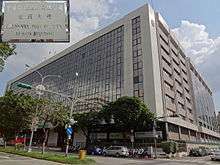 Chunghwa Post was a government organization of Ministry of Transportation and Communications until 2003, when it was reorganized into a government-owned corporation. Its affiliation with the Universal Postal Union began in 1914, but ended in 1972 when it was replaced by the China Post shortly after China's seat in the United Nations was handed over to the People's Republic of China. International Reply Coupons are not available to Taiwan Area, and mail is not delivered to or sent directly from Taiwan Area, but rather routed through third-party countries, with Japan Post as a major route facility for incoming mail sent from the Americas region. Chinese Taipei is a member of Fédération Internationale de Philatélie and Inter-Asian Philatelic Federation. Chunghwa Post delivers standard letters, registered mail, parcels, and express mail through the Taiwan Area. There are twenty-three large offices throughout the country which supervises some 1,300 smaller post offices. The direct ancestor of Chunghwa Post is the Customs Post Office of the Qing Empire, established in 1878 by Li Hongzhang at the suggestion of the foreign powers, with branch offices in five major trading cities. On 20 March 1896, the Customs Post Office became the Great Qing Post, which in 1911 became independent of the customs service. On 1 January 1912, the Republic of China was established, replacing the Qing Dynasty. The Great Qing Post changed its name to the Chunghwa Post  "Chunghwa" is a transliteration of one of the names of China, which connotes the multi-ethnic nation under a unified culture of "China". Alternatively spelled "Zhonghua" (in pinyin transliteration), this term is part of the Chinese language name of both the Republic of China and the People's Republic of China. Chunghwa post had contracted with aviation groups such as China National Aviation Corporation and China Airways Federal to deliver airmail on the Shanghai-Hankow, Nanking-Peking, and the Hankow-Canton routes in early 1929. It was on the Nanking-Peking route, where renown early-20th century poet Xu Zhimo caught a flight, but died as the airmail-carrier plane operated by China Airways Federal under contract, crashed in rough weather. In 1888, Liu Mingchuan, Qing Governor of Taiwan Province, established the Taiwan General Post Office (GPO) of the Great Qing Postal service (大清郵政官局). However, in 1895, Taiwan was ceded to Japan following the first Sino-Japanese war. The Taiwan GPO was abolished, with postal service in Taiwan conducted by a variety of bodies such as the Field Command postal service, and after 1924, the Letters Department of the Ministry of Transport. Taiwan was taken over by the Republic of China in 1945. In 1946, the Republic of China government incorporated the postal service in Taiwan into Chunghwa Post. In 1949, the Republic of China lost control of much of mainland China to the People's Republic of China. The operation of Chunghwa Post was soon after restricted to Taiwan, several surrounding islands, and a few islands off the coast of mainland China still under the control of the Republic of China government. 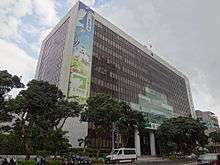 In 2003, Directorate General of Posts of the Ministry of Transportation and Communications changed its structure from a government department to a government-owned corporation, and was renamed to Chunghwa Post Co., Ltd.
Taichung Post Office when the Chunghwa Post was renamed to the "Taiwan Post". 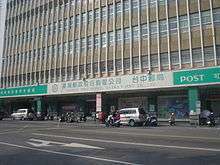 In February 2007, ROC President Chen Shui-bian announced that the name of the postal service would be officially changed to Taiwan Post, with sign changes occurring at branches in Taiwan on February 12. Media reports noted that "Taiwan Post" was more consistent with the name Governor Liu Ming-chuan used when he founded the Taiwan Post Administration in 1888. Furthermore, Taiwan Post began printing "Taiwan" instead of "Republic of China" on postage stamps. On February 9, the board of directors resolved to change the name of the corporation to Taiwan Post Co. (台灣郵政) after a delay of several hours due to protests from unions. However, a bill to recognise the change of law was blocked by the KMT-dominated legislature. As a result, the law still mandated the postal monopoly for "Chunghwa Post" despite the name change. In 2008, the Kuomintang took power in Taiwan following a legislative election victory and the election of Ma Ying-jeou to the presidency. Following his election, Ma Ying-jeou publicly stated that he did not wish his inauguration commemoration stamps to be marked "Taiwan Post", because the name change was "illegal". The postal service marked the inauguration stamps with Chinese characters for the "Republic of China", as well as "Republic of China (Taiwan)" in English. On 1 August 2008, the company resolved to reverse the name change and restored the name "Chunghwa Post". The Board of Directors, as well as resolving to restore the name of the corporation, also resolved to re-hire the chief executive dismissed in 2007, and to withdraw defamation proceedings against him. ↑ Chunghwa Post Co., Ltd.
↑ http://www.post.gov.tw/post/internet/h_about/YearRepost98/98_Company%2520Profile.pdf - "On January 1, 2003, the Directorate General of Posts was corporatized to become Chunghwa Post, which was 100% owned by the MOTC. The assets and liabilities as well as the businesses of the Directorate General of Posts were transferred to the new entity."